Cape Insights is a boutique travel company that operates special interest tours around South Africa for discerning, curious visitors who want interactive travel, authentic experiences, and enriching encounters. Our tours cover the cultural landscape: Food & Wine; Art/Craft & Design; One-of-a-kind Architecture like Cape Dutch; Gardens & indigenous flora; History from the emergence of man to the dawn of democracy; Archaeology along with unique rock art. Why not extend your holiday with a stand alone trip before or after an in-depth special interest tour? Private trips made to fit your party, your dreams. Tailor-made to your timelines and tastes. Our customized special interest tours can be guided or self-drive holidays. Your choice! We design in-depth travel tours that stimulate your mind, delight your eye & engage your senses. You get a look at South Africa’s unique blend of cultures, cuisines, heritage and history. You are accompanied by specialists whose local knowledge brings your trip to life. We distil our local know-how so that you get an insider’s perspective & take less travelled roads. We share our black book so you explore hidden gems, savour regional wines & seasonal dishes. You connect with a variety of experts, hear multiple perspectives and experience our diversity. Our hallmark is that you are escorted by local experts and deeply informed every step of your way. Our fields of focus: Architecture; Gardens; Gastronomy; History; Archaeology; Art/ Craft & Design. 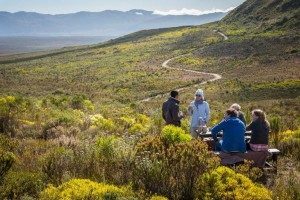 Grootbos Private Nature Reserve outside Cape Town just announced as overall winner of the African Responsible Tourism Awards at the World Travel Market Africa, 2019 … Read more.